After much research, and a couple of Google searches later, I found a simple solution involving some simple config file edits. Damn, after working with IIS for the past 6 months, I got used to not having to deal with config files. 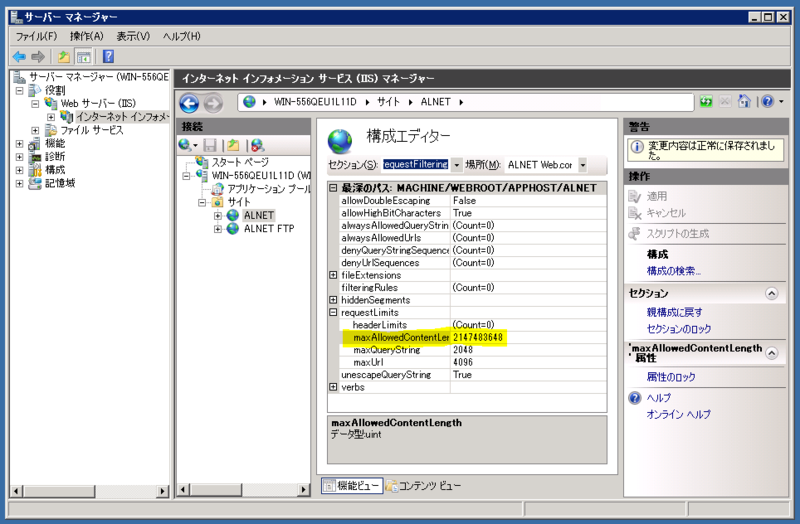 Anyway, the file you want to modify is C:\Windows\System32\inetsrv\config\applicationHost.config. I don’t know if it makes any difference, but I’ve converted the folders that hold my PHP scripts into Applications through the IIS Manager. Add the following lines to the bottom of the file, making sure it’s inside the <configuration> area. Where “Default Web Site” is the name of your website, “alnet” is the name of the application, and “2147483648” is the amount you want to set for the upload file limit in bytes. So as you can see, I’ve set my IIS to accept file sizes up to 2GB. You can add as many of this as you need. I have 3 applications, so I have three of these in my config XML script. You can also use the following line at a command prompt. Be sure to navigate to “C:WindowsSystem32inetsrv” first.